Calcium channel blocker is useful in the treating patient with supraventricular arrhythmia ( verapamil and diltiazem ) and hypertension as well as angina. Calcium channel blocker will reacts by binding and blocking the voltage gated calcium channel of the vascular smooth muscle and cardiac smooth muscle. This will inhibit the calcium ion’s flow into the cell which finally cause the decrease in the contraction of the muscle. Calcium channel blocker may include class IV anti arrhythmic agents such as diltiazem and verapamil as well as others such as amlodipine, nifedipine. 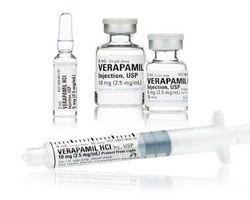 Verapamil posses a greater effects on the cardiac tissue while nifedipine posses a greater effects on vascular smooth muscle. The common side effects of calcium channel blockers are gastrointestinal discomfort, hypotension, bradycardia and heart block.